Should single use carrier bags be banned? Discussions on this topic increase in the media of many countries. More and more countries try to banish lightweight plastic bags in particular from retail or at least to reduce their consumption. However, not only carrier bags belong to the sector bags and sacks: The current Ceresana bags and sacks market report, which is already the second edition, also provides extensive information on garbage bags and sacks, heavy duty and industry sacks as well as pouch packaging for foodstuffs. Many different influential factors affect this complex market. Besides several plastic types, the study also deals with bags and sacks made of paper. Demand for heavy duty and industry sacks depends to a large extent on the economic development of the respective countries. Trade links are very important for transport packaging: Demand can profit from free trade agreements and free movement of goods; protectionist measures and trade barriers, however, can impede market dynamics. Furthermore, the construction economy in particular has a decisive impact since construction materials are often transported and traded in woven plastic or polyethylene bags. The fundamental trends regarding the development of the economy as well as the construction industry are therefore analyzed in detail in individual country profiles. Chapter 1 provides a description and analysis of the global market for bags and sacks made of plastics or paper – including forecasts up to 2025. For every region of the world, figures such as demand split by material and by application as well as amounts of production split by material are given. In Chapter 2, the demand for bags and sacks split by application and material, production split by material ("LDPE", "LLDPE", "HDPE", "other plastics (film)", "woven plastics”, "paper") as well as import and export split by material are analyzed for 16 countries. Chapter 3 analyzes the application areas of bags and sacks in detail: Data on the development of demand in the application areas carrier bags, garbage bags and sacks, heavy duty and industry sacks, food packaging, as well as other applications. The indications are further split by material (plastic and paper). 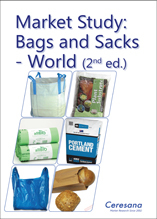 Chapter 4 takes a look at the demand for bags and sacks split by the types of material polyethylene, other plastics (film), woven plastics, as well as paper. Chapter 5 provides useful profiles of the largest bags and sacks manufacturers, clearly arranged according to contact details, turnover, profit, product range, production sites, profile summary, product types, and application areas. In-depth profiles of 107 manufacturers are given, including Amcor Ltd., DowDuPont, Formosa Plastics Corporation, Mondi Group, Oji Holdings, Sealed Air Corporation, Smurfit Kappa Group Plc, Stora Enso Oyj, Toppan Printing Co., Ltd.